Primeval Labs presents a three-in-one legal prohormone for ridiculous gains like you've never seen before! Mass! Aggression! Strength!Mass! Aggression! Strength! Increase strength and muscle mass! This is a completely legal pro-hormone which serves as a precursor to Stanolone, an incredibly androgenic steroid hormone. Not only does it work to increase protein synthesis for muscle growth but it also increases lipolysis, or fat loss. Stanolone has been shown to inhibit the aromatase enzyme which causes testosterone to convert to estrogen, thus decreasing the amount of estrogen in the body. EpiAndro also has some direct neurological effects similar to a pre-workout to increase focus and aggression in the weightroom. As a naturally occurring pro-steroid in the body, 1-Andro goes through a double conversion into the metabolites 1-androstenediol and 1-androstenedione. From there it is then converted to 1-testosterone where the strongest androgenic effects occur. It does not convert to estrogen so users do not have to worry about bloating and gyno. 1-Andro will significantly enhance strength and muscle mass while also improving vascularity. Similar to 1-Andro, 4-Andro goes through the conversions and becomes 4-testosterone. This provides significant increases in muscle mass and works to preserve muscle by enhancing protein synthesis. 4-Andro will also up your mental intensity giving you that edge you need in the weight room as well as increasing your libido in the bedroom! Tri-Andro is recommended in a 6-8 week cycle with at least 8 weeks off between cycles. Revolutionize your results in the gym with this powerful strength enhancing mass gainer! 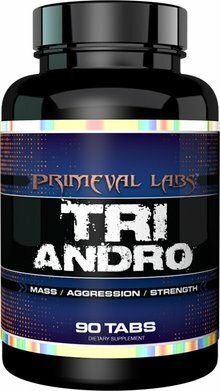 Primeval Labs delivers a powerhouse mass and strength builder with Tri Andro. Epiandro supports aggression, strength, and muscle definition. 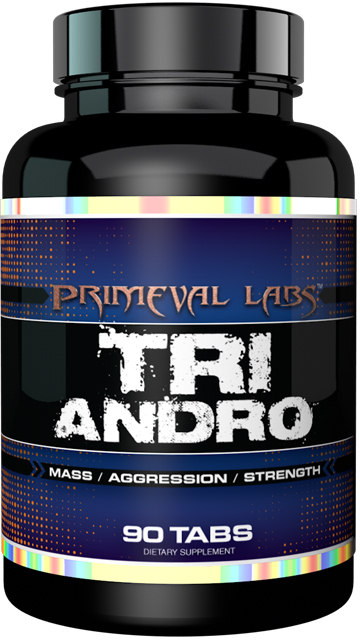 Tri Andro also elevates testosterone to amplify muscle mass and size with 1-Andro. 4-Andro works with 1-Andro to aid muscle building while also enhancing libido. Take charge in the gym and the bedroom with Tri Andro! Revolutionize your results in the gym with this powerful strength enhancing mass gainer!Revolutionize your results in the gym with this powerful strength enhancing mass gainer!